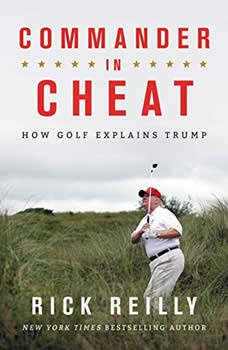 An uproarious indictment of Donald Trump's lying, cheating, and poor sportsmanship--by the bestselling author and acclaimed sportswriter.Commander in Cheat: How Golf Explains Trump is an on-the-ground and behind-the-scenes look at Trump's ethics deficit on and off the course. Reilly will transport readers onto the golf course with President Trump, revealing the absurd ways in which he lies about his feats and what they can tell us about the way he leads off the course in the most important job in the world. Reilly has been with Trump on the fairway, the green, and in the weeds, and has seen first-hand how the president plays--and it's not pretty. Based on his personal experiences, and interviews with dozens of golf pros, amateurs, developers, partners, opponents, and even caddies who have first-hand experience with Trump on the course, Reilly takes a deep and often hilarious look at how Trump shamelessly cheats at golf, lies about it, sues over it, bullies with it, and profits off it. From Trump's ridiculous claim to have won eighteen club championships, to his devious cheating tricks, to his tainted reputation as a golf course tycoon, Commander in Cheat tells you everything you need to know about the man.